Sarah has been sick this week, so we've done some nice cuddling on the couch. We've done some snuggling and some reading and have enjoyed these adorable classics from Kinder Cottage Publishing. 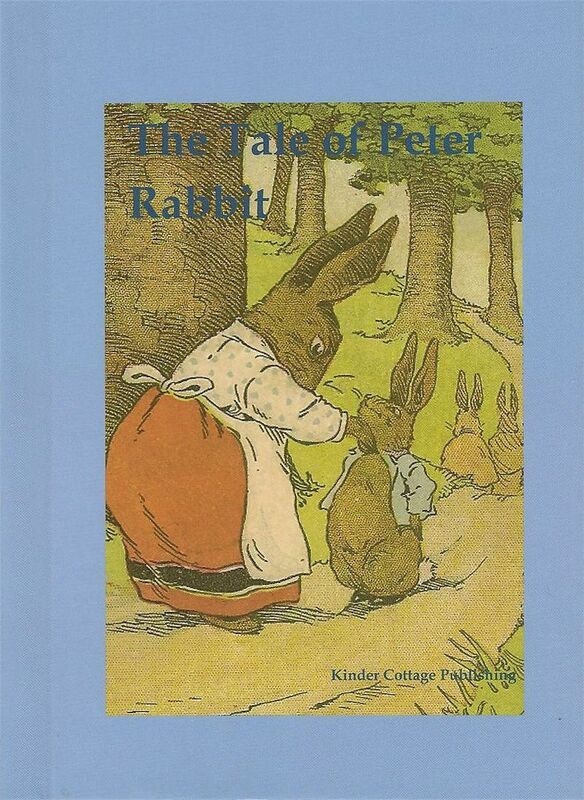 They sent us two books: The Tale of Peter Rabbit and When Peter Rabbit Went to School. 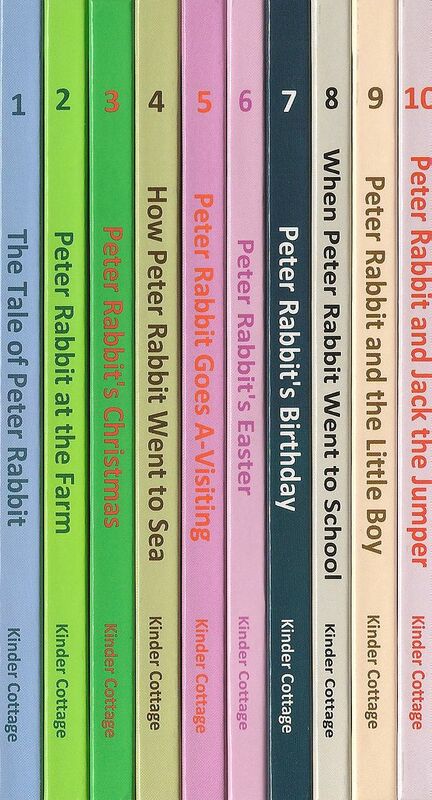 There were 20 books originally written about Peter Rabbit and his antics. There are 10 books currently available in the series, and I would love to read every one of them. These books were originally written by Duff Graham for the Henry Altemus company back in 1917! They have been edited to modernize the text somewhat. For example - the word velocipede was used in the original texts to mean bicycle. The edits did not detract from the beautiful language of the original stories; they only removed confusing impediments that might have distracted from the flow of the words. The language is rich, and it is perfect for the hungry ears of children ages 3-9 (or older ears who pretend they aren't there to listen to a children's book, but linger in the room to hear the rest of the story. You know how it is. They have to find the right pencil.) The quality of the books is excellent. They have hard, glossy covers and beautiful vintage illustrations. And, Oh, the smell of printer's ink. I love these books. The Tale of Peter Rabbit ($4.00) is the classic tale we all love. Peter, who just can't seem to resist doing exactly what he's told not to. It's a trait that we, as humans, have shared since God told Adam not to eat of the fruit. I love the beauty of the lessons felt, but not preached in this story. He rebels. He suffers. He fails to learn. He rebels. He suffers. And through it all, he is loved. It is such a relatable tale that resonates well with children. They understand him. They are equally shocked at him. How has he not learned?? How do we not learn? Is it just me, or does the moment when Peter jumps into watering can to hide remind you of the story of Adam and Eve hiding from God and attempting to cover themselves with fig leaves? 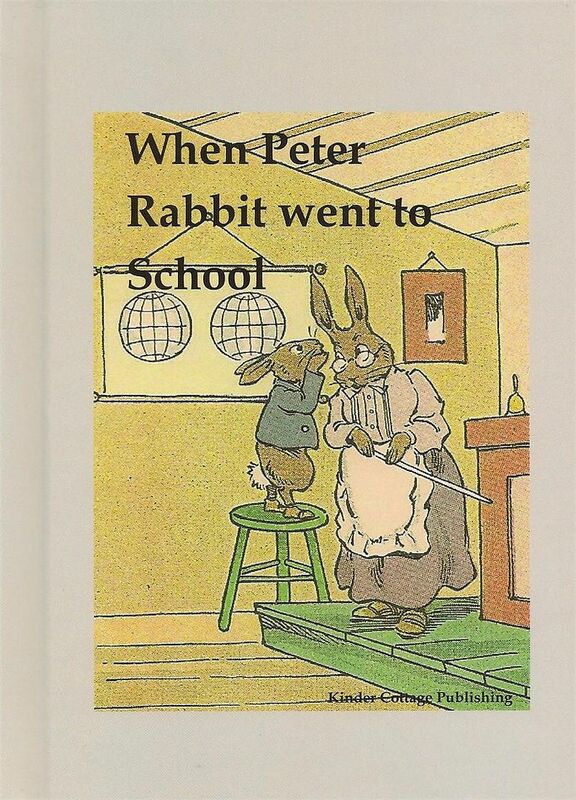 When Peter Rabbit Went to School ($4.00) is a Peter Rabbit story that I had never read before. I chose it for my sweet girls who love "going to school" at our dining room table. In it, Peter again can't resist doing exactly what he is told not to do. But he is repentant. The sweet cover photo relates to the end of the story where Peter whispers a promise to his teacher to never do that again. He's learning, poor guy. I love that the teacher is introduced firmly disciplining at the first sign of disobedience, but is loved and respected by the students. In an age when parents are afraid of earnign the disfavor of their children, it is refreshing to read about a time when it was known that children crave standards, rules, and consistency. They may not like them. They may even rebel against them. But they crave them all the same, needing their reassurance and security. Kinder Cottage is an independent book publishing house, created by Howard and Ann Closs. The work was born out of their passion for providing an education which would encourage a love of literature, history, culture, and the Christian faith for their 4 young sons. They publish the Peter Rabbit series and a Wizard of Oz series. Currently, they are developing a series to introduce children to the 10 most influential people in England's history. The first book in this series, Alfred the Great, is now available. Their next project is a picture book biography series on the founding fathers of America. Kinder Cottage has offered my readers a coupon for a discount on their already curiously low prices. Use coupon code TOS at checkout to receive a 20% discount off the product price on their website. Be sure to check out the adorable Advent calendars which are also offered on their site, at a price as amazing as the rest of their products. The Review Crew received several different books to review, so be sure to check thoughts on the different options available by clicking the banner below. You don't know the other books in this "series" because they are not in this series! The Tale of Peter Rabbit was written by Beatrix Potter, and I can't help but notice that her beautiful illustrations are missing from your copy. The other titles, she did not write at all. They are knock-offs, if you will, and not something I'd add to a home library. I think I would have a hard time not reading the original Peter Rabbit. We love Beatrix Potter and even more so after visiting her house last summer. The books on English History sound interesting.